Happy to announce that my Lovecraftian short story, 'The Lucky Mouth', has been accepted for publication in Bleed, a children's charity anthology (although the story is hardly fit for a child). This is a reprint, and since it is one of my favourite pieces, I am glad to see it published again, and for such a worthy cause. More information as it come in. Double play this morning. My heroic fantasy short story, "Legacy" was accepted by Aurora Wolf Magazine, and my Cthulhu Mythos story (second I have written and published) was accepted by Lovecraft eZine. "Legacy" was one that had some trouble finding a home, and yet I always believed in it – it is unique on a number of levels. I believe this story will be published on 1st October 2012. "Dom and Gio's Barber Shop" is one of my more recent creations, I am a noticeably better writer than a few years ago, and it was a pleasure to have my story accepted by a very discerning market, who specializes in, and are authorities of, Lovecraftian stories. Publication date is still to be determined. It would appear that Anthology of Ichor III: Gears of Damnation, will be released on time in April 2011. My short story, The Happy Mouth, is one of the 14 short stories contained therein (along with 2 full length novels) totaling to 550 pages. A large tome (tomb?) indeed. 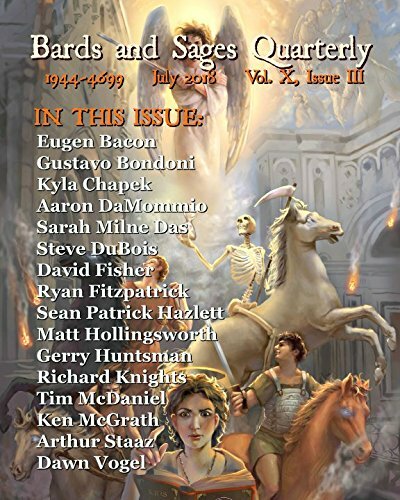 Thanks to Unearthed Press for including my Mythos story into their project. So here's the cover – pretty full on; I like it. My short story, The Lucky Mouth, was accepted by Unearthed Press for their Anthology III, to be published in June 2011. That’s 6 days from conception, writing, drafting, submission and acceptance. Ah, I have been a Lovecraft fan since I could read, and I have designed Mythos stories for well over twenty years – more like 26 – all RPG. I reckon I designed, maybe, 50 or 60 stories. Well, for the first time I am writing a mythos story for a challenge among my circle of writer friends. The only question rising out of this – why didn’t I do this before? Title is The Lucky Mouth. Should finish it by tomorrow.